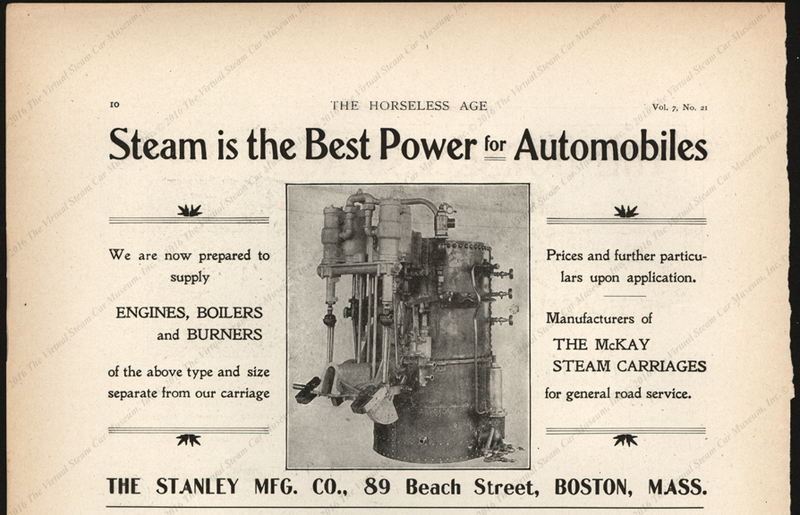 Stanley Manufacturing Company, McKay Steam Automobile. 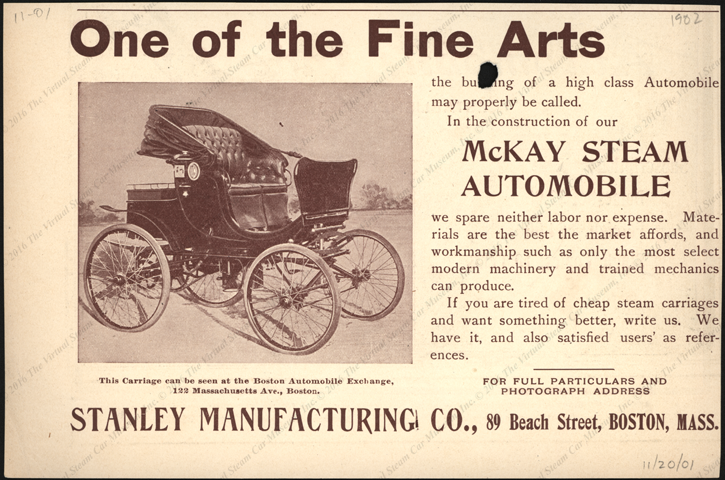 The McKay steam car was, in fact, a Stanley carefully redesigned so as not to infringe any of the patents which the Stanley twins had granted to Locomobile and Mobile. Locomobile nevertheless threatened to sue the Stanley company so they completely redesigned the car, replacing the vertical engine and chain drive by a horizontal engine and direct drive ton the rear axel. This became the 1902 model of the new Stanley Motor Carriage Company. 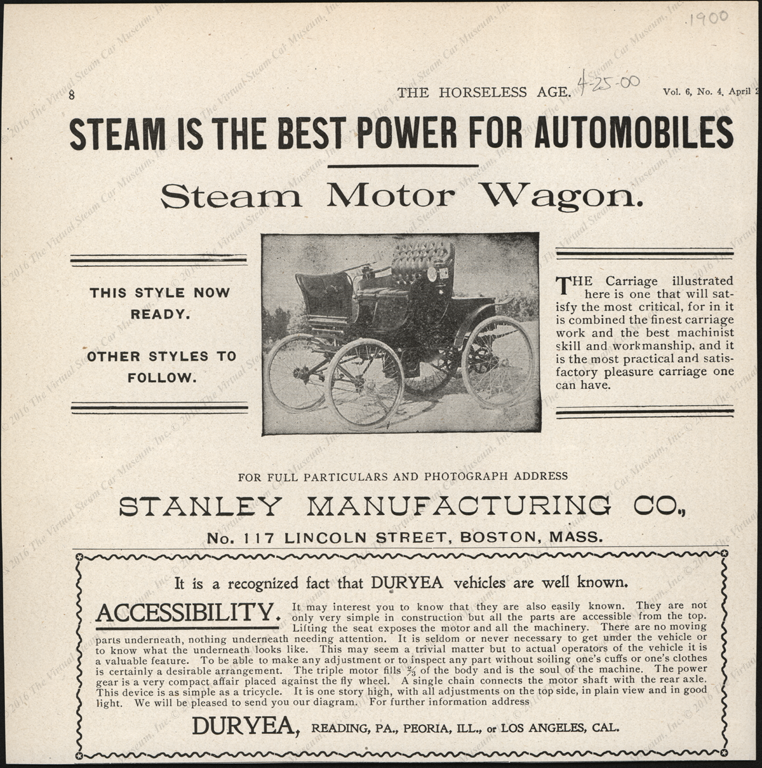 The Stanley Manufacturing Company placed this advertisement in the April 25, 1900 issue of Horseless Age, page 8. 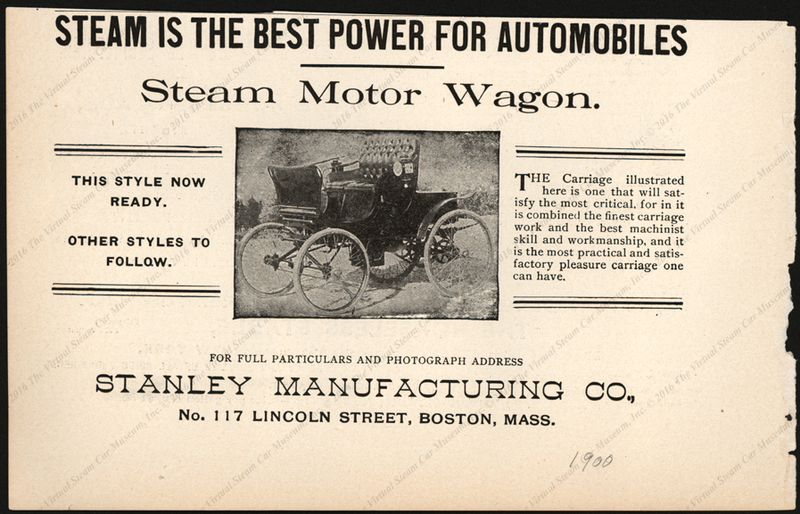 The Stanley Manufacturing Company placed this advertisement in the August 22, 1900 issue of Horseless Age, Vol. 6, No. 21, page 8. The Stanley Manufacturing Company placed this advertisement in the September 5, 1900 issue of Horseless Age, Vol. 6, No. 23, page 8. 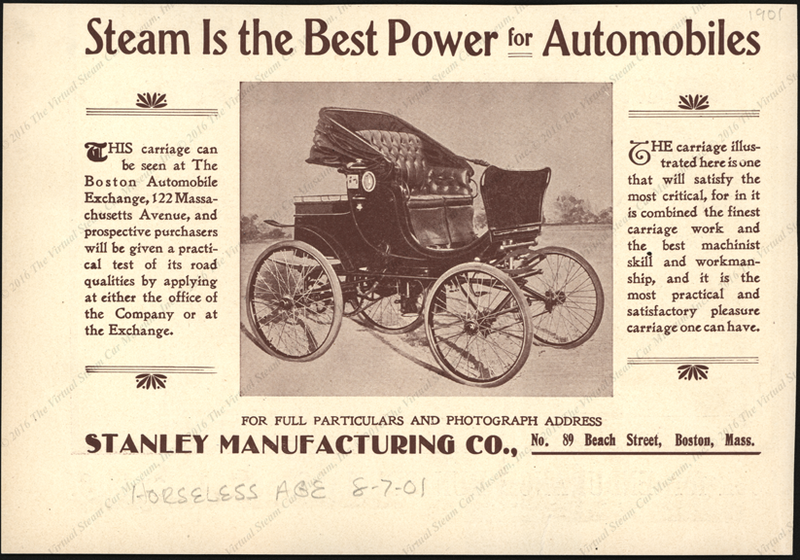 The Stanley Manufacturing Company placed this advertisement in the a 1900 issue of Horseless Age. 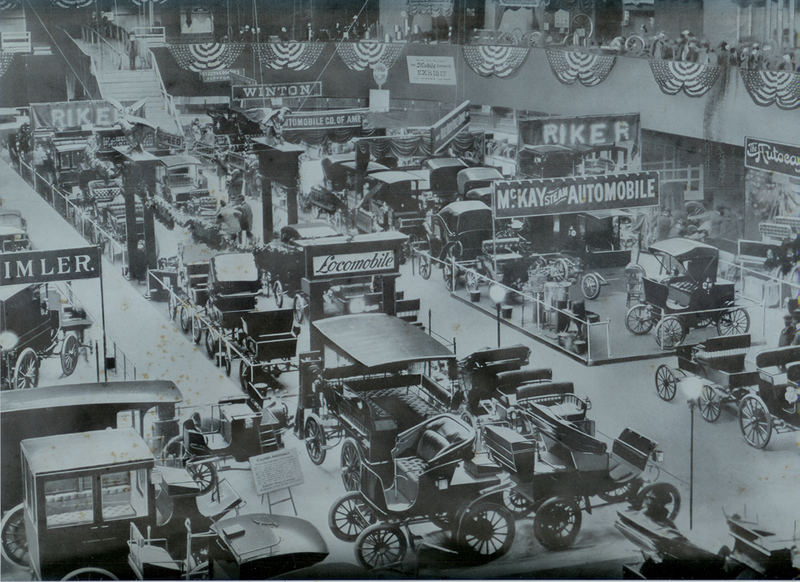 The McKay Steam Automobile had a large display at the January 1901 New York Auto Show, directly across the isle from the Locomobile Company of America. Further down the isle is the Automobile Company of America and a sign for the Mobile Company of America is visible. 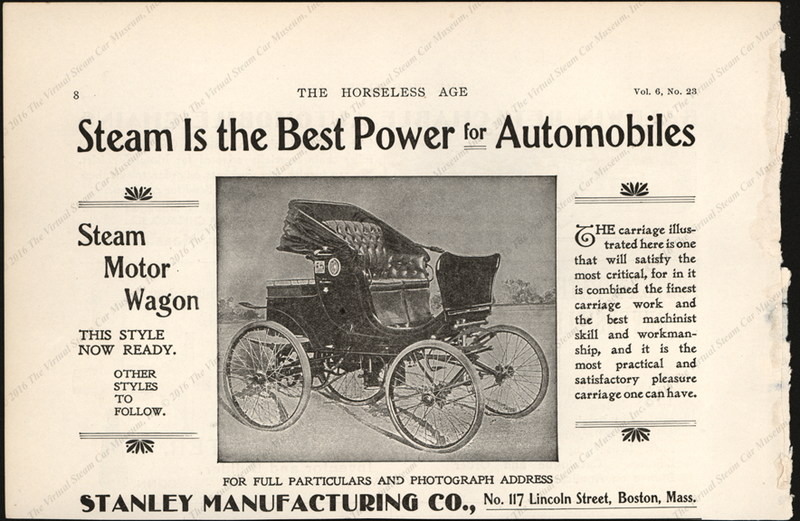 The Stanley Manufacturing Company placed this advertisement in the February 20, 1901 issue of Horseless Age, Vol. 7, No. 21, page 10. 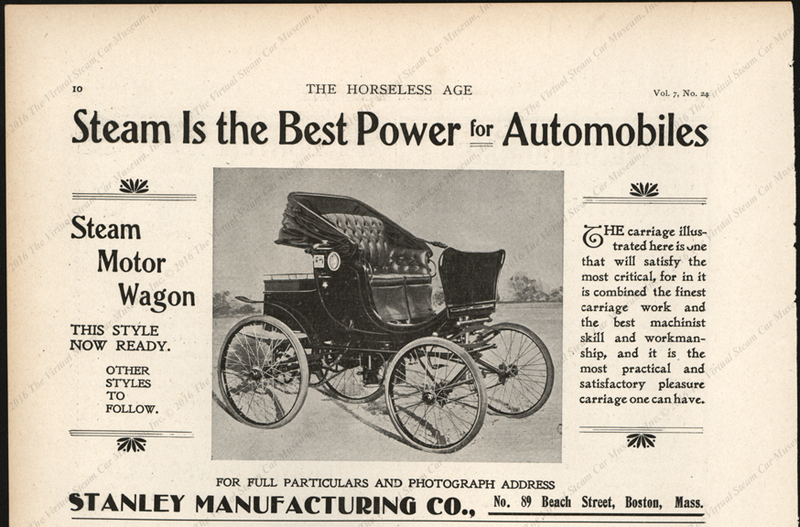 The Stanley Manufacturing Company placed this advertisement in the March 3, 1901 issue of Horseless Age, Vol. 7, No. 24, page 10. The Stanley Manufacturing Company ran this advertisement in Horseless Age on November 20, 1901. It ran a similar advertisement January 15, 1902. 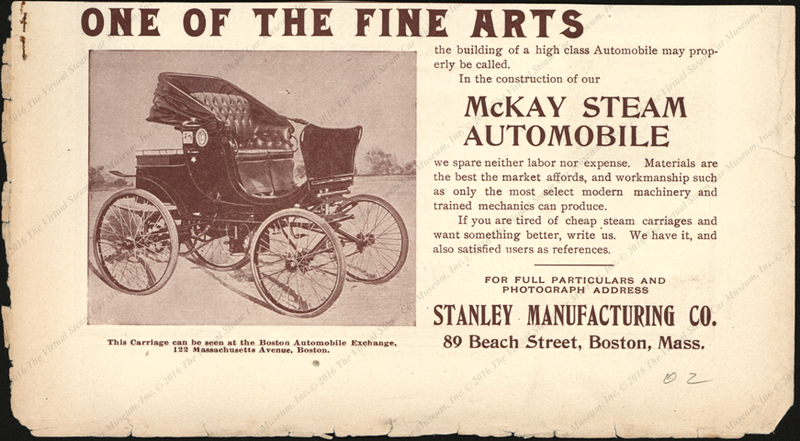 The Stanley Manufacturing Company called its vehicle the McKay Steam Automobile when it ran this advertisement in Horseless Age on November 20, 1901. It ran a similar advertisement January 15, 1902. 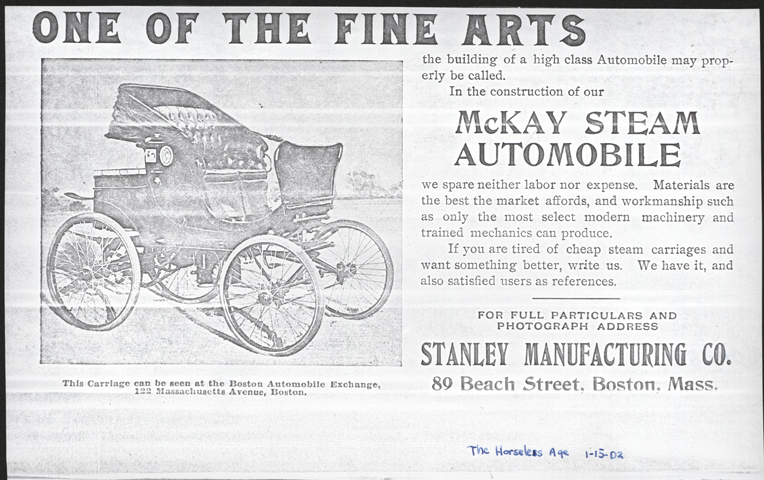 The Stanley Manufacturing Company promoted its McKay Steam Automobile in Horseless Age on January 15, 1902. Photocopy. John A. Conde Collection. 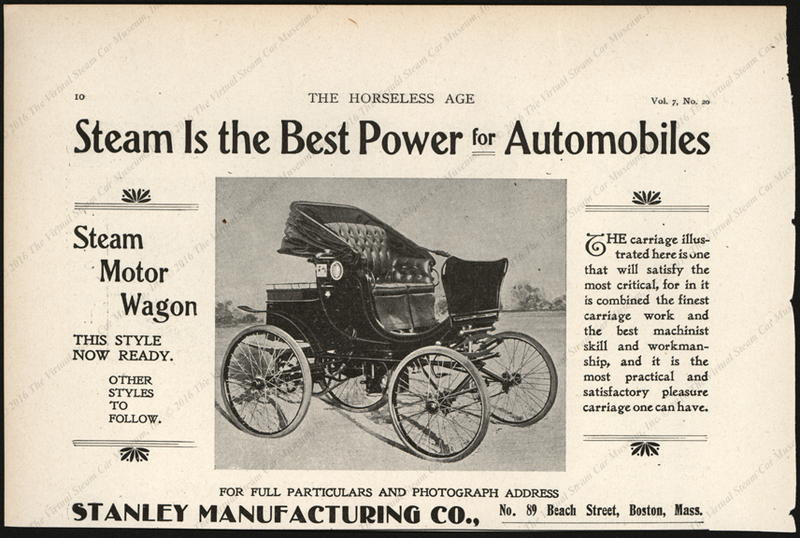 The Stanley Manufacturing Company placed this advertisement in the a 1902 issue of Horseless Age. 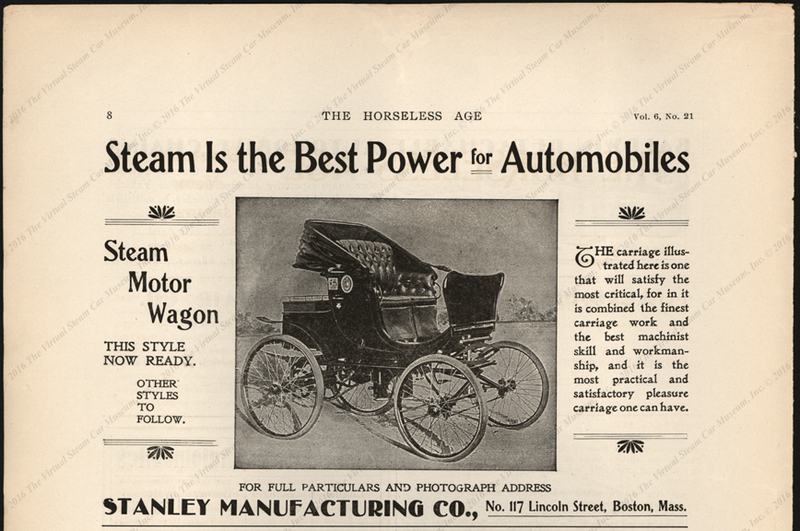 The Stanley Manufacturing Company placed this advertisement in the February 13, 1902 issue of Horseless Age, Vol. 7, No. 29, page 10. Georgano, G. N., Encyclopedia of American Automobiles, (New York, E. P. Dutton & Co., 1968), p. 128. Contact us if you have additional information about the Stanley Manufacturing Company, the McKay Steam Automobile, or if you have questions.